Situated at the foothills of the Andes, in the heart of the Maipo Valley wine country, Casa Ishi offers you the tranquility and stunning beauty of the Mediterranean, coupled with a range of opportunities for outdoors activates, sports and unforgettable day trips. With its quaint charm and delightful atmosphere, the Casa Ishi Vacation House features a dramatic wood-beamed ceiling, a spacious dining room that opens onto a terrace offering dazzling views of the sunset, and a fully-equipped kitchen with bar area and 6-person seating. Each of the three bedrooms is furnished with comfortable beds and high-quality linens. Crack a window open at night to let in the soft breeze and the sounds from the nearby Maipo River lull you to sleep. The Vacation House is part of an expansive 2.5-acre property, surrounded by lush greenery and a fruit garden providing a much-needed shade and comfort during the hot days. Make sure to wander through the property and walk around the lush gardens, stopping to pick a fruit or two from our abundant apricot, avocado, fig, lemon, orange, plum and walnut trees or sample the grape arbors. Seek shade under the century-old palm trees or enjoy a chilled cocktail in the perennial gardens. And, to end your day with style, check out the mud oven and roast some veggies and meat over the stone barbecue. Or even hire a private chef to prepare an authentic Chilean meal! 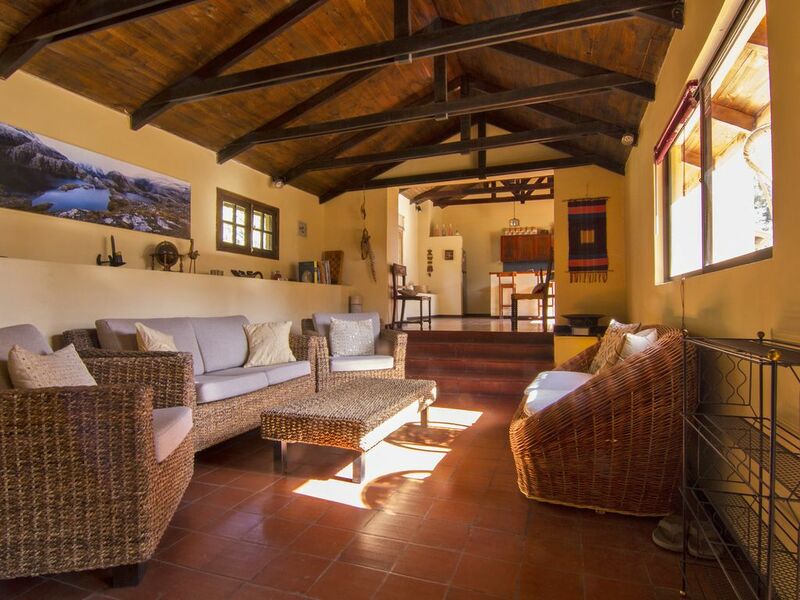 Casa Ishi is located in San Juan de Pirque, a semi-rural area in the renowned Maipo Valley. This is the most celebrated appellation in Chile, home to some of the oldest vineyards in South America. Nearby wineries include Concha y Toro, Almaviva, Haras de Pirque, Cousiño Macul, De Martino and Santa Rita, where you can have tours, tastings and dine on fine cuisine. Casa Ishi is only 10 minutes from the center of Pirque there you can shop in our modern super market, eat in local restaurants and cafes, gas up your car, access the ATM, or visit the distinguished Concha Y Toro Winery located right in the middle of Pirque. For outdoor enthusiasts, we are on the road to the San Francisco glacier and access to the Andes. Its excellent location just 30 miles from Santiago de Chile international airport provides ample opportunities for outdoor activities and day trips that will make for an exciting and fulfilling holiday. The Casa Ishi property is completely secure and enclosed and offers free parking for up to 3 cars. Upon your request, we can provide access to drivers and professional tour guides. Casa Ishi is the perfect retreat for an extended family trip. Discover the beauty of the Mediterranean and relax with style in Casa Ishi! Long-term renters encouraged! Substantial discount for rentals of more than 3 weeks. Michelle is an avid gardener, and lover of food and wine. I found my paradise in Chile, where there are the freshest organic vegetables, outstanding wines and some of the most delicious olive oil that I have ever tasted. And what could be better than being able to cultivate many of these riches on my own property. My passion is enjoying a healthy and fulfilling life, living in a stimulating environment, with access to nature and delicious fresh food. For many years I had traveled extensively in Europe and Asia. When I came to Chile in 2009, to visit Easter Island, I stopped in Santiago for a few days, which I discovered is a very green, modern, cosmopolitan city. I took a drive to the countryside to have lunch at Santa Winery in the Maipo Valley, and fell in love. Fortunately, I found a property for sale in the Maipo Valley, which I was able to purchase. And Casa Ishi was born. Chile is unlike any other country in South America. Because of its natural beauty, high literacy rate, and fairly stable political situation, it can be best described as the Switzerland of the south. Chile is a paradise for nature lovers and outdoor enthusiasts. Within the country, one can find a diverse variety of landscapes including vineyards, volcanoes, deserts, beaches, lakes, glaciers and forests. Nature, culture, food and people just are few of the reasons to visit Chile. The Mediterranean climate is unbeatable. At the Casa Ishi Villa we are minutes away from some the best wineries in the world. A half hour from the Andes mountains, where there is a wide range of outdoor activity to suit your needs. And less than an hour from the center of Santiago and the international airport. It is hard to find a more convenient location.Only 40 minutes from Santiago, this year-round tourist destination is known for its picturesque scenery, multiple renowned vineyards, and flora and fauna. Pirque is one of the most beautiful places in the Santiago Metropolitan Region. We recently spent seven days at Casa Ishi. The gardens are magnificent, bursting with color, and orange and avocado trees abundant with fruit. A romantic sitting area under the grape arbor is perfect for an evening of tapas and wine. Mornings on the terrace with a good book are especially relaxing. The location is convenient and offers easy access for day trips to hot springs, white water rafting, horseback riding or a bike ride through wine country and wine tasting. The hosts, Michelle and Teiji, are very accommodating and make a genuine effort to ensure your privacy yet are available should you need anything or have any questions regarding the surrounding area. We were two couples and the house was very spacious. I would recommend Casa Ishi without hesitation. Everything was more than we possibly could have imagined! Grocery within 3 miles, numerous vineyards. We cruised from Buenos Aires to San Antonio, then 5 more days here at Casa Ishi. What an amazing place. The house was beautiful, surrounded on one side by serene gardens, lots of fruit trees, and on the back the sounds of the river below to put you to sleep at night. House was tastefully decorated, spotless, patio out back was perfect for long, leisurely dinners on warm, summer nights. You fee like you're out in the countryside, but a 20 minute drive away is the Santiago metro system, and easy access to the big city. Michelle was a thoughtful and respectful host. We'll definitely be back on our next trip to Chile. Casa Ishi was a perfect place for our stay in the Maipo Valley. The house was wonderful and clean with plenty of space, nice amenities and surrounded by lovely gardens. Michelle was welcoming and very helpful with the cottage as well as local attractions. We enjoyed man wonderful dinners on the terrace using the barbecue provided. Whilst the house is on the fringe of the city it was an easy subway ride right to the heart of downtown. Definitely recommended for people with a rental car who like to explore the local area, wineries etc. Michelle was very accommodating and responsive. The place was clean. Michelle even gave us the extra home so we can spread out for no additional charge. The place is clean, organized, beautifully landscaped and easy access to the winery in PIRQUE. I will go back there again given another opportunity. Michelle even arranged our transport to the airport. Wonderful host! Only 40 minutes from Santiago, this year-round tourist destination is known for its picturesque scenery, multiple renowned vineyards, and flora and fauna. Pirque is one of the most beautiful places in the Santiago Metropolitan Region. The “Haciendas” (or farms), which form part of the town of Pirque, go back to the times immediately after the Spanish conquest. At first, the lands were used for raising cattle and farming. Later, after the construction of "La Sirena" canal in 1834 – ordered by Ramón Subercaseaux – Pirque’s surroundings began to change. His son-in-law, Melchor de Concha y Toro, married to Emiliana Subercaseaux, brought the wine industry to Pirque from the Bordeaux region of France. Pirque has kept its beauty intact with “little” impact from urban development, thanks to strict regulations limiting growth. The town’s fertile lands, ideal for wineries such as "Concha y Toro", "El Principal", and "William Févre", among others. Pirque has thousands of square kilometers of hills, rivers, natural parks, mountains, and a diversity of attractive flora and fauna. It is called an island because the “Maipo” river surrounds it. Another river is the “Río Clarillo”, a natural reserve with many other beautiful sites.